Starting Tuesday, March 1, APSU students will be able to take Uber rides around Clarksville. Student Government Association President Will Roberts made the announcement at the Wednesday, Feb. 24, SGA meeting. He said there could potentially be a promotional coupon for students to redeem a free or discounted ride. SGA also proposed three new pieces of legislation including Act No. 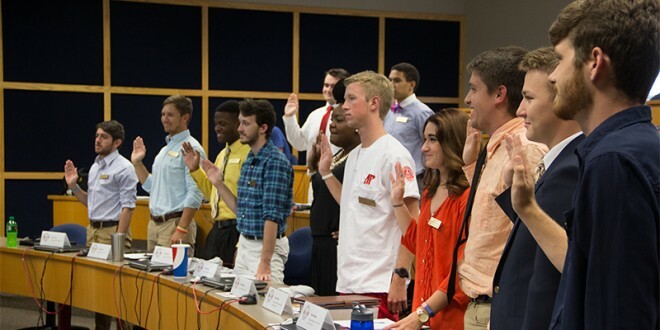 10, which would require SGA to publish their financial records for each fiscal year. This includes the start and end balance of SGA’s budget and all income and expenditures. This act is similar to the “Sunshine Act,” which was originally presented during the Sept. 16, SGA meeting. The “Sunshine Act,” placed the responsibility for publishing the financial report on the executive secretary, whereas Act No. 10 places this responsibility on the Executive Council. The “Sunshine Act,” was proposed because “SGA upholds an open-door policy which promotes accessibility with APSU students,” according to the legislation. Act No. 10 was proposed because SGA acts in the interest of the students of APSU according to the legislation. Act No. 10 was authored by Sens. Dylan Kellogg and Johnathan Johnson. Resolution No. 26, which aims to have the Emerald Hill Apartments allow pets, was also presented at the meeting. The resolution cites the pets bring companionship to their owners and how Meacham Apartments will be pet-friendly starting in the Fall 2016 semester as reasons for the proposal. This resolution was authored by Sen. Jake Bumpus. The final piece of legislation presented was Resolution No. 25, which seeks to have the speed bump between the Felix G. Woodward Library and the Clement Auditorium removed. This resolution was authored by Bumpus. All three pieces of legislation will be debated at the next SGA meeting on Wednesday, March 2. Chief Justice Lucas Bearden also said applications for positions on SGA are opening on Wednesday, March 2. Elections for all SGA members, including 2016-17 SGA president and vice president, will be held March 29-31 and ratification will be on April 1. SGA is continuing to prepare for the second installment of The Big Event on March 19. Anyone interested in registering for The Big Event can do so at apsu.edu/sga/big-event-student-registration. The next SGA meeting will be on Wednesday, March 2, at 4 p.m. in the Morgan University Center room 307.